When I made a peach cheesecake recently I wanted to make a chocolate version for my boyfriend as he doesn't eat peaches. I came across a recipe on the Kraft Philadelphia website for a no-bake chocolate cheesecake using chocolate Philadelphia, and then when I went to the supermarket the next day chocolate Philly was half price.... so I think somebody was telling me to make this recipe! At least, those are the ingredients from the recipe, I did end up adapting them slightly to use up what I already had in the house. Mix with the melted butter and press into the bottom of a tin. I lined it with greaseproof paper which turned out to be a good move in the end. Whisk Philadelphia and creme fraiche. I actually used fat-free fromage frais as I had some to use up, and I decided it would be similar enough - but it ended up a little runny and I wonder if this was the problem. Dissolve the gelatine according to the instructions on the pack. The recipe said to use powdered gelatine but I had sheets; I worked out how much I thought I would need according to the quantities on the packet but as the final dish was a bit too runny, I'm wondering if I didn't use enough. Maybe it was a combination of using fromage frais instead of creme fraiche and not using enough gelatine - next time I'll follow the recipe properly! A bit on the runny side - you had to eat it with a spoon rather than a fork - but otherwise it was pretty good, and very simple to make! 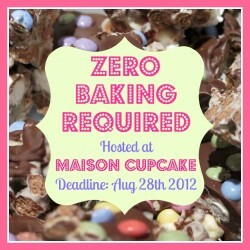 As there was no baking required, I am sending this in to Maison Cupcake's Zero Baking Required Challenge, a new event which she started this month. 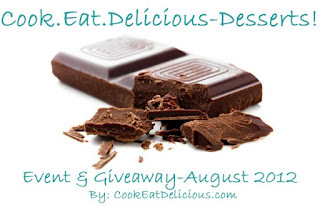 Secondly I am sending this to Culinary Vibes' Cook Eat Delicious Desserts blog challenge, as this month's theme is chocolate. Finally I am sending this to Frugal Food Fridays hosted by Helen of Fuss Free Flavours as it ticks several boxes - the ingredients are cheap, even more so as the main ingredient was half price, and no baking means not paying for the electricity for the oven!